(CNN) - A new wrinkle emerged Thursday in the autobiography of a rising Republican star: Sen. Marco Rubio, R-Florida, was once a Mormon. Rubio, a Cuban-American who has played up his Catholic roots on the campaign trail and today attends Catholic churches as well as a Southern Baptist megachurch, was a member of the Church of Jesus Christ of Latter-day Saints as a young boy. Rubio's attendance in the church was little-known and made a splash when details of a forthcoming memoir were reported Thursday by the Miami Herald and the website BuzzFeed. Thursday afternoon, Rubio's spokesman elaborated on his complex journey of faith. "He's well along in the writing. We're aiming for an October publication," said Will Weisser, the associate publisher at Sentinel, a Penguin Group (USA) imprint. At the moment, it is not releasing excerpts of the tentatively titled "An American Son," nor would Weisser go into further details on the production of the Rubio-penned book. In 1979, when Rubio was 8 years old, his family moved to Las Vegas and joined an LDS church for several years, according to Conant. He said Rubio was baptized as an infant in the Catholic church, but when they formally joined the Mormon church, Rubio was again baptized. Dale Jones, a spokesman for the LDS church, said 8 is traditionally the earliest age when a child of that faith would be baptized. When Rubio was 11 years old, his family returned to Catholic tradition. While the family still lived in Las Vegas, Rubio received First Communion, a sacrament in the Catholic church when adherents take communion for the first time. When Rubio and his family moved back to Florida in 1985, he went through confirmation in the Catholic church. He was later married in a Catholic church, and his children were baptized in that faith. His office said Rubio considers himself "a practicing Catholic." Today, the senator splits his time between Washington and Miami. While he is in D.C., he worships at St. Joseph's Catholic Church. Near the Senate office building buildings on Capitol Hill, the church is a favorite with politicians and Supreme Court justices. Another twist revealed Thursday: About 2002, Rubio left the Catholic church and began attending what was then First Baptist Church of Perrine, now called Christ Fellowship. "While they were never baptized or registered as members, they attended regularly," Conant said. When he is in Miami, Rubio attends St. Louis Catholic Church and Christ Fellowship, a Southern Baptist multisite church with 8,000 regular attendees. In 2005, Rubio returned again to the Catholic church, though "he enjoys the sermons and the excellent children’s ministry at Christ Fellowship and still attends often," according to Conant. The information about Rubio's church history and the content of the book first came to light in a Miami Herald blog post Thursday morning. In addition, the Herald reported, when Rubio's father was 18, "he took part in an ill-fated military plot to overthrow Dominican dictator Rafael Trujillo." And on a lighter note, Rubio and his aides would watch the spoof rock documentary "Spinal Tap" to "loosen up." Weisser said the Herald's characterizations of what the book will contain were accurate. When the book deal was announced, the publisher said the book will detail the rise of the GOP star and junior senator born to parents who left Cuba shortly before Fidel Castro took control of the island. Rubio, 40, campaigned heavily as the son of exiles and reported on his website that his parents fled under the dictatorship of Castro. But controversy grew over his family's history last October after a Washington Post report found that his parents left Cuba in 1956, before the start of Castro's regime. The news prompted critics to attack Rubio for embellishing his life's story, to which Rubio replied that he was unaware of the exact dates until the story broke. While his staff members updated his website after the story published, the senator still maintained that he was the son of exiles, as his parents weren't allowed to return to Cuba under Castro's rule. Sentinel acquired the rights to the memoir after a "competitive" auction process with six publishing houses. 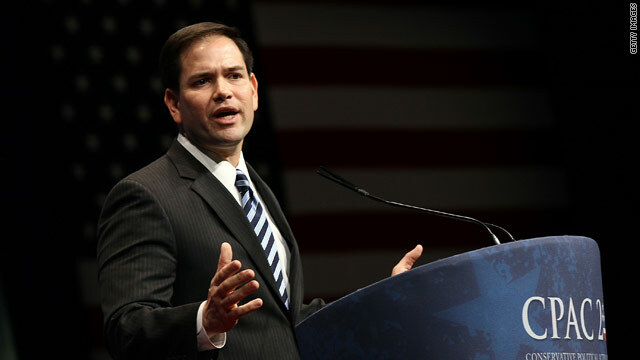 Many speculated that Rubio's history with the Church of Jesus Christ of Latter-day Saints could further ingratiate him with Mitt Romney, one of America's most prominent Mormons, and make him a viable candidate for vice president should Romney win the Republican presidential nomination. Conant batted away any political speculation around the details of Rubio's faith journey, saying, "I’ll leave the political analysis to the folks who do that." Pedro Alejandro un hijo ya viejo de decendiente de la santa inquisicion . As Baptists, we welcome people of other faiths with open arms. What is the controversy? Since CNN is such a big supporter of liberals and Democrats, is this just another opportunity for you to make a controversy to try to knock Mr. Rubio's stature among conservatives? If he has been a Mormon, Baptist and Catholic, more power to him..........he is a person of faith in the end. That is far better than being a person with no moral core, right? I don't think we should be vetting Mr. Rubio so much since he is not running for president right now. We have a president that received no vetting from CNN or those who voted for him and look what we got.................a partisan ideologue who has brought the number of Americans who need food stamps to a record high, embraced policies that have resulted in 23 million Americans unemployed or under-employed, decreased household incomes by $4000 annually, increased the number of Americans dependent on the federal government to nearly 50% and appointed dozens of "czars" who we know nothing about and who were also never vetted. This stuff about Rubio is just meant as a distraction to a nation in crisis because of the person in the White House. "That is far better than being a person with no moral core, right? " – Tom, are you implying that only a person of faith has morals? hello!,I really like your writing so much! percentage we keep up a correspondence more about your post on AOL? I require an expert in this house to resolve my problem. Maybe that is you! Having a look ahead to look you. I was suggested this website through my cousin. I'm no longer positive whether this put up is written via him as no one else recognise such exact about my trouble. You are wonderful! Thank you! We are a bunch of volunteers and opening a brand new scheme in our community. Your website provided us with valuable information to paintings on. You've performed a formidable job and our entire community shall be grateful to you. Excellent article. I've bookmarked your website so I can revisit your future stories. Keep up the fantastic work!